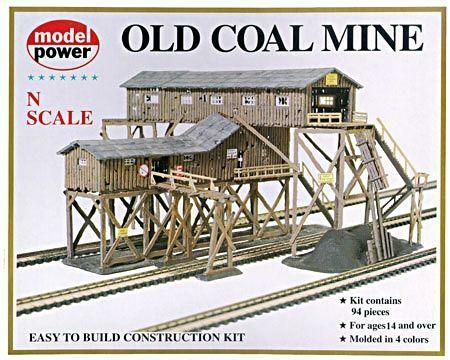 This is an N Scale Old Coal Mine Plastic Assembly Kit from Model Power. Model Power designed this Old Coal Mine for use with N SCALE railroad layouts or dioramas. This set fits into almost any industrial or refinery area layouts. This is a true-to-life replica. Retail $39.97 SAVE 23% ! "With a little work this model looks fantastic"
This kit shows fine wood grain detail even in N Scale. With a little work with weathering chalk, you can achieve a fantastic looking model for your layout. I chose to make it an abandoned mine because of the state of disrepair of the wood. Also, I had some problems with small handrail pieces breaking. That would be natural in an abandoned mine. I especially liked the shake shingled roof. Shingles were irregular with many broken--just like a real old roof. I recommend it. Plastic construction (molded in four colors--tan, dark gray, light gray, and dark brown). Parts may be painted or weathered. Includes water-transfer decals "No Smoking", "National Casket Co", "Authorized Personel Only", & "Danger". "good kit to build and weather." this is the second mine kit i have built. the first was chewed to piece&apos;s by my ex-girlfriend&apos;s dog. true story. can&apos;t make this stuff up. so now i will build this one and there are no dog&apos;s around. i was a little worried about this kit. i ordered the model power lumber yard kit not long ago and it was so twisted and warped i had to use hobby stick&apos;s and a lot of twist tie&apos;s to hold every thing straight till the glue set. and with this kit using the same type wall&apos;s i was worried it may be in the same shape. but after looking it over it is as straight as a string. no twisting or warping to be seen. the detail is nicely done and it will take some time to build it is going to look rally nice on my layout. i have bought many model power kit&apos;s over the year&apos;s and have been disappointed only once. the lumber yard kit. but i was able to salvage that kit and it turned out looking pretty good. this kit did not disappoint. it is up to what i expect from model power. the instruction&apos;s are fairly clear if some what small. will make a great addition to any layout.